Words placed in italics are found only in the untranslated phonetic text (Ph) and are missing in the interlinear version (I). Those missing in the interlinear text and found only in the untranslated phonetic text are indicated by an underline. (60) There a man and a woman were who married. They lived in an oval lodge. The man hunted. Finally, they had a baby, and he was a male. And that child was a big eater. So his father ran away, going to the south. That man ran away from his son the big eater. He went very far indeed. His wife also ran away. She went towards the south. The man came to a long lodge. There were ten men, who were brothers. Afterwards the woman also came. Every morning the brothers would go hunting. (61) They were killing deer and some bear. Then arriving, he called on that old man and he was asked to gamble. He was a Giant (Man-Eater). Then he took his ten grandsons and his nephew with him to gamble. The others went to where the Giants lived to race. The old man was to race against two Giants. They were to race to the end of the earth, where the turn-around marker was. The old man ran away from them. He won and then killed the Giants. They went to their lodge. And the woman also came, following her husband. And in the spring their son also came. (62) He came after his parents. Their boy, the big eater, came. And that big group of men were mighty happy. They were happy because of the boy. Epilogue. The old man was the sun (wiragere), the day luminary (Hąpwira), and his wife also was the moon. And their boy, the big eater, became a horse and ate the green grass. The horse, the youngest born, was chief over the ten men. He is a star that is always close by the sun. His four brothers went upwards, and the five [remaining] were also wolves. They journeyed about on the earth, living as human beings. Commentary. 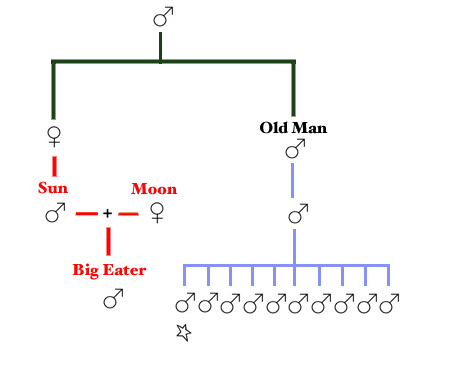 "a big eater" — being a big eater is also an attribute of his father Sun, as we learn in the story Grandfather's Two Families. There Sun eats so much that his children flee from him. So the horse takes after his father in having a ravenous appetite. "going to the south" — this describes the direction that the sun moves with the onset of winter. The reason why a man would flee a glutton at this time of the year is that game becomes scarce during the winter and even under normal circumstances it may become hard to feed oneself, let alone a big eater. "the youngest born" — in the Hočąk, this word, nąǧixununįgera, is placed last in the sentence. This is on the supposition that it is a post-positional subject, one occurring at the end of the sentence for the sake of emphasis, as so often happens in story telling. However, it might be the subject of the next sentence. Nevertheless, even making such a revision does not change the meaning of either sentence. More substantial is the difference between the two MSS (Ph and I). In Ph, the sentence begins with Égi uañk kéreponaížą, "And ten men." This seems misplaced, as the object ought to come after the subject. It was later dropped completely in the revised version (I). 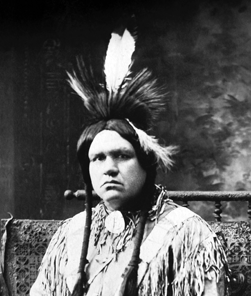 In which case, the sentence would read literally as, "Horse chief he was, the youngest." As the first horse he would be chief over horses in any case. Breaking the wording into two sentences after nąǧixununįgera may also be a mistake. The suffix -gają, while it often terminates a sentence, more usually marks off a clause whose action is simultaneous or prior to that of the succeeding clause. So the two sentences might read together as, "Being the horse leader, the youngest born is a star that is always there close by the sun." Despite the confusions over sentence construction, no matter which of the possible ways in which these word can be translated, it does not make any substantive difference in the meaning (as long as we drop "and the ten men"). "his four brothers went upwards, and the five [remaining] were also wolves" — in another story, Grandfather's Two Families, the grandfather is the sun and his ten grandsons are a combination of Animal Spirits and Stellar Spirits. Of the latter, the youngest is Morning Star and the next youngest is the Red Star (the Evening Star). By implication, the nephew or grandson of this story's old man (the grandfather of the ten brothers) is Sun, the father of the Chief of Horses. In Grandfather's Two Families, the youngest of the ten brothers is a star that always stays close to the Sun, and therefore ought to be Morning Star. Here the suggestion is that the youngest, the horse, just is Morning Star. The occurrence of wolves in the story recalls the affinity held to subsist between them and horses, which were called šųkxétera, "great dogs," the word for dog being, šųk, and for wolf being, šųkčąk, also meaning "great dog," but from a synonym. Horses and dogs are alike in being draft animals. However, horses and dogs may have other things in common (see Comparative Material below). "I did not tell it all" — Often when someone bought a story, but did not want to pay what the whole was worth, he received a shortened version which touched upon the essential points, but left out many important details. This is such a story. The long version would have been almost identical with Sun and the Big Eater, but there are some important points of difference between them. Comparative Material. A Horse Spirit as the offspring of Sun and/or Moon is widespread in world mythology, especially in Indo-European. In Sanskrit (Indian) mythology, Saranyu ("Bright") is a mare who conceives the Divine Twins, the Aśvins, from her impregnation by the sun, Vivasvant.2 These twins are hippomorphic, and are identified with the Morning and Evening Stars. In the Hočąk story, the youngest of the ten brothers is a "star" that always stays close to the sun, and appears to be identical to Morning Star. In Indo-European horse sacrifices, the offering is often accompanied by that of a (black) dog,3 which shows that the connection between horses and dogs is not a peculiarity of North America. Links: Horses, Giants, Sun, Moon, Wolf & Dog Spirits, Celestial Spirits, Bluehorn (Evening Star), Morning Star. Stories: mentioning horses: Thunderbird and White Horse, The Orphan who was Blessed with a Horse, Sun and the Big Eater, Rich Man, Boy, and Horse, Hare Recruits Game Animals for Humans, The Horse Spirit of Eagle Heights, Trickster Takes Little Fox for a Ride, James’ Horse, The Boy who was Blessed by a Mountain Lion, The Boy who Flew, Pete Dupeé and the Ghosts, They Owe a Bullet, The Man Whose Wife was Captured (v. 2); featuring Sun as a character: Sun and the Big Eater, Grandfather's Two Families, The Children of the Sun, The Twins Retrieve Red Star's Head, Hare Burns His Buttocks, The Birth of the Twins, The Man who was Blessed by the Sun, The Origins of the Milky Way, Red Cloud's Death; pertaining to the Moon: The Markings on the Moon, Black and White Moons, The Twins Retrieve Red Star's Head, Sunset Point, Sun and the Big Eater, Hare Kills Wildcat, Grandfather's Two Families, Berdache Origin Myth (v. 1), Turtle and the Giant; about stars and other celestial bodies: The Dipper, Įčorúšika and His Brothers, The Seven Maidens, Morning Star and His Friend, Little Human Head, Turtle and the Witches, Sky Man, Wojijé, The Raccoon Coat, Sun and the Big Eater, The Star Husband, Grandfather's Two Families, Bluehorn's Nephews, The Twins Retrieve Red Star's Head, The Meteor Spirit and the Origin of Wampum, The Children of the Sun, Heną́ga and Star Girl, The Origins of the Milky Way, The Fall of the Stars; relating to dogs or wolves: The Gray Wolf Origin Myth, A Man and His Three Dogs, White Wolf, Wolves and Humans, The Wolf Clan Origin Myth, The Old Man and His Four Dogs, Worúxega, The Dogs of the Chief's Son, The Dog that became a Panther, Baldheaded Warclub Origin Myth, The Wild Rose, The Man Whose Wife was Captured, The Resurrection of the Chief's Daughter, The Canine Warrior, The Dog Who Saved His Master, The Raccoon Coat, Wojijé, Why Dogs Sniff One Another, The Healing Blessing, The Medicine Rite Foundation Myth, Trickster Loses His Meal, Sun and the Big Eater, Redhorn's Sons, Trickster, the Wolf, the Turtle, and the Meadow Lark, Hog's Adventures, Holy One and His Brother, The Messengers of Hare, Pete Dupeé and the Ghosts, Grandmother's Gifts, The Hočąk Migration Myth, Bladder and His Brothers, The Stench-Earth Medicine Origin Myth, The Old Man and the Giants, Rich Man, Boy, and Horse, Kunu's Warpath, Morning Star and His Friend, Chief Wave and the Big Drunk; Peace of Mind Regained (? ); featuring Giants as characters: A Giant Visits His Daughter, Turtle and the Giant, The Stone Heart, Young Man Gambles Often, Spear Shaft and Lacrosse, Redhorn Contests the Giants, The Sons of Redhorn Find Their Father, Morning Star and His Friend, The Reincarnated Grizzly Bear, The Old Man and the Giants, Shakes the Earth, White Wolf, Redhorn's Father, The Hočągara Contest the Giants, The Roaster, Grandfather's Two Families, Redhorn's Sons, The Meteor Spirit and the Origin of Wampum, Thunder Cloud is Blessed, Little Human Head, Heną́ga and Star Girl, Rich Man, Boy, and Horse, Sun and the Big Eater, How the Thunders Met the Nights, The Origins of the Milky Way, Ocean Duck, The Blessing of a Bear Clansman, Wears White Feather on His Head, cf. The Shaggy Man. The long version of this story is Sun and the Big Eater. However, it differs in an interesting number of particulars and should probably be considered a variant. Themes: gluttony: Grandfather's Two Families, Sun and the Big Eater, Hare Visits His Grandfather Bear; someone is rejected by at least one member of his family: Sun and the Big Eater, The King Bird, Grandfather's Two Families, Kaǧiga and Lone Man, Moiety Origin Myth, The Chief Who Shot His Own Daughter; someone eats so much that his closest relatives flee from him (to avoid starvation): Sun and the Big Eater, Grandfather's Two Families; a (grand)father abandons his family: The Father of the Twins Attempts to Flee, The Two Boys, Sun and the Big Eater, Grandfather's Two Families, The Birth of the Twins, The Two Brothers, Trickster Visits His Family; a man flees until he reaches a lodge belonging to ten brothers with whom he then lives: Sun and the Big Eater, Grandfather's Two Families; a man is adopted into a family who live in a distant village: Sun and the Big Eater, Grandfather's Two Families, Moiety Origin Myth, Origin of the Decorah Family, The Captive Boys; a large group of brothers (usually ten) live alone together: Sun and the Big Eater, Įčorúšika and His Brothers, The Quail Hunter, Bladder and His Brothers, Wojijé, The Race for the Chief's Daughter, The Spotted Grizzly Man; contests with the Giants: Spear Shaft and Lacrosse, Redhorn's Father, White Wolf, The Roaster, Young Man Gambles Often, Little Human Head, Redhorn Contests the Giants, Redhorn's Sons, Morning Star and His Friend, The Reincarnated Grizzly Bear, Sun and the Big Eater, The Hočągara Contest the Giants, The Old Man and the Giants, The Meteor Spirit and the Origin of Wampum, Shakes the Earth, The Origins of the Milky Way, The Shaggy Man, Grandfather's Two Families; racing to the end of the world and back: Old Man and Wears White Feather, Spear Shaft and Lacrosse, The Green Man, The Roaster, Young Man Gambles Often, Morning Star and His Friend (v. 2), Sun and the Big Eater; an old man wins a race: Sun and the Big Eater, Grandfather's Two Families; some of a group of brothers are Stellar Spirits and others are animals: Sun and the Big Eater, Įčorúšika and His Brothers, Grandfather's Two Families. 1 Frank Ewing, Untitled, in Paul Radin, Winnebago Notebooks, Freeman #3892 (Philadelphia: American Philosophical Society, 1909, recopied and corrected, 1945) Winnebago III, #11b, Story XI: 61-63. Told by Frank Ewing. Frank Ewing, Story of the Boy who Ate too Much, in Paul Radin, Winnebago Notebooks, Freeman #3899  (Philadelphia: American Philosophical Society, 1909?) Winnebago III, #19, Story 19c (2), 9-14. 2 Wendy Doniger O'Flaherty, Women, Androgynes, and Other Mythical Beasts (Chicago: University of Chicago Press, 1980) 174-178. 3 O'Flaherty, Women, Androgynes, and Other Mythical Beasts, 159, 162, 183, 202.